Anyone else feel like when the major sales happen, they all happen at once?? My wallet is hiding in fear between Amazon Prime Day and the Nordstrom sale coming up... Not good! Wanted to quickly talk about this look that I wore over the 4th when I was home in Chicago! I don't normally go for off the shoulder much any more but I really loved how unique this dress was so it was hard to pass up! 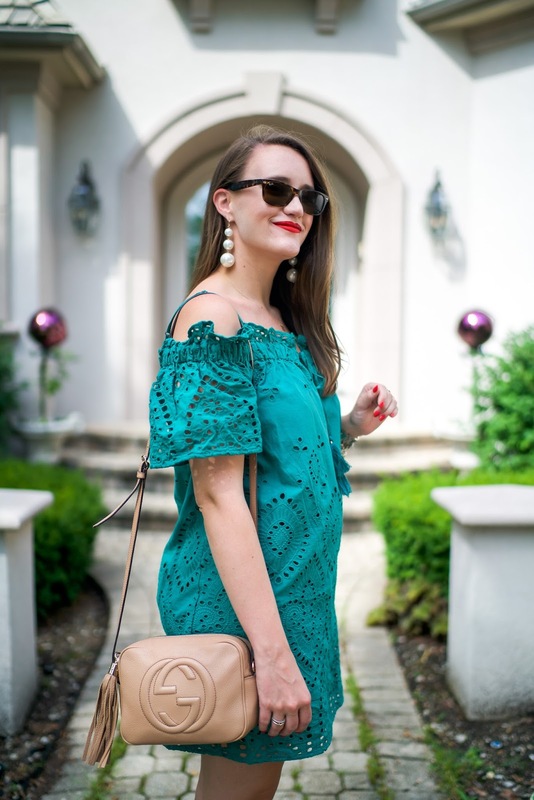 You know I have a deep love for anything eyelet but I was really stepping out of the box (for me) with this green color. I think it kind of works with my pale skin, right?? It definitely ran a little boxy so if you're able to, I'd size down when ordering! And again, wearing these shoes because they make my legs look a mile long and I love them!! PS thanks to my sister for letting me borrow her bag when she was napping :) LOVE YOU! 1. My Steamer - This is my all time #1 purchase and something that I have re-pruchased and recommended to friends as well. I don't travel without it and I use it just about daily in my apartment. It's SUPER affordable and does the job. What more could you ask for? 3. SD Cards - Being a blogger/vlogger you need a LOT of SD cards and big ones too and I always order mine from Amazon. I even have a little pelican case to carry all of them! 4. Wet Brush - Literally the only brush I'll use on my hair now and it really helps with damage! I talked about it in my haircare post but I really do love it. I'm thinking about getting the mini's too for my bag! 5. Furbo - We LOVE our Furbo and I've actually repurchased it for friends but it's perfect if you have a cat or dog at home. It's a pet camera! You hook it up to your app and can see and talk to and feed treats remotely to your animal. We love it for long trips so we can check in on Dixie but it's made really for dogs. It will tell you when they are barking! 6. Black Loafers - Fun news, these are back in stock! But I wear these literally all the time to work. They are super comfortable, look identical to the Gucci pair and are on sale! 7. Flexible Tripod - I use this for my smaller vlogging camera but I use it all the time! It's the only way I'll hold or set up that camera now -- it's become the cameras second skin. More helpful than one would think! 8. Tool Kit - May seem random but you don't understand how much I use this tool kit randomly throughout my days in the apartment. I guess you don't know what you need until you have it? Literally it has everything you would need. 9. Makeup Mirror - I use this mainly for videos when I'm in front of a camera and not in front of a mirror but it's really helpful with the extra light and the magnification. Plus it doesn't hurt that you can just fold it up and store it away when you're not using it! 10. Smoothie Maker - My sister got this for me for my birthday in May and I haven't stopped using it. I'm now the queen of making strawberry banana smoothies and don't let anyone tell you otherwise! !